Hardware sales are on the slide — check out this chart from Japanese TV. But Nintendo of America president Reggie Fils-Aime doesn't see this as a problem. It's cyclical. Looking back, 2006 and 2007 were awesome years for console sales. 2008 was so-so. 2009? Blergh. Fils-Aime points out that while hardware sales are down, software sales will be big this year and next. The record year of 2008 is very difficult to overlap. "I look at our performance and see it's right on track with where we believed it would be," Fils-Aime tells Bloomberg. "What we are seeing today is a strong momentum for hardware and software. Profitability in this industry is in software." Fils-Aime sees this year and next year the software peak for the industry. "This industry is cyclical in that a system's sales peak in the third calendar year," he adds. "The fact that we've seen a decline year on year is standard." What was not standard was Nintendo's incredibly strong sales of 2008. 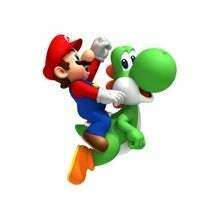 "The record year of 2008 is very difficult to overlap," the Nintendo exec concedes. That year, it seems, is how Nintendo's success is currently being judged — an unfair and unrealistic metric for comparison.